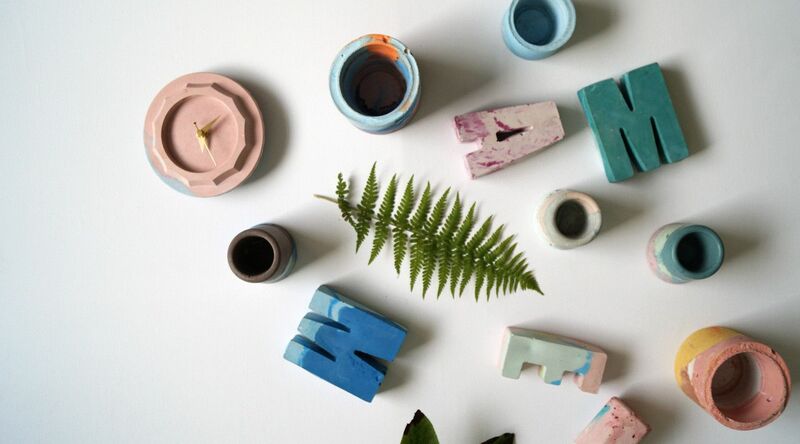 ‘Colour Block’ contains a series of vessels and functional art objects created using recycled materials. Each is completely unique in it's colour, texture and design. Unusual architecture and urban areas have been a great influence in McDowall’s work, as well as the notion of trial and error. The lack of control over the natural process of the materials she uses, paired with her carefully considered colour palette for each piece, make each one completely unique. Adding the fusion of colour makes her strong, bold industrial pieces softer, more aesthetically pleasing and the result is a powerful display of the relationship between strength and beauty. McDowall graduated in 2015 from Gray’s School of Art with a BA (Hons) in Printed Textile Design, specialising in screen printing, prior to experimenting with new materials, including concrete. The maker has since moved to Edinburgh, residing in her own studio, always working on new, exciting projects and commissions which push the boundaries of concrete.